2018 Parade is cancelled because of the weather but the "Extravaganza" will go on indoors. Faced with forecasts of 40 mile per hour winds, daytime temperatures plunging through the 40s and up to two inches of rain, RIOC acted swiftly to cancel a likely to be miserable Halloween Parade on Saturday and shifted the party indoors. Introducing an new spelling for Sportspark, RIOC's recreational facility at 250 Main Street, in the shadow of the Queensboro Bridge, the State agency dashed plans for this year's march but saved its "Extravaganza*" (It's not.) by relocating it safely indoors. 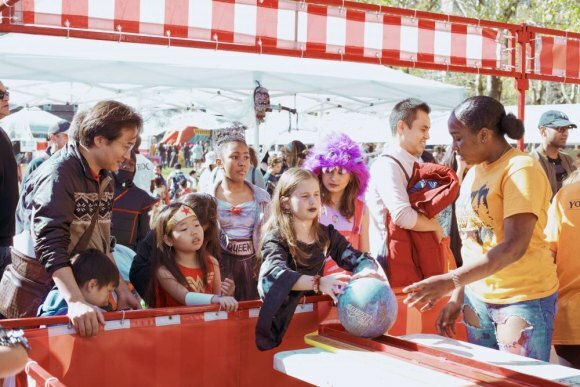 "The annual Roosevelt Island Halloween Parade down Main Street has been cancelled, but the post-parade Extravaganza will be moved inside to Sportspark," RIOC said in a late Wednesday afternoon press release. The event runs from 12:30 until 3:00 p.m.
"Residents and guests are still invited to dress up in costumes and enjoy the free giveaways, amusements, games, costume contests, and live DJ music at the 250 Main Street recreation facility. All attendees must enter through the westside (sic) (Manhattan-view side) entrance," the release added, forgetting again that Roosevelt Island is Manhattan. *Extravaganza is a favorite term with RIOC, used last year and presumably this year for its disappointing holiday decorations developed in partnership with Southtown developer Hudson. In fairness, although neither fits the definition of an "extravaganza, the Halloween Party is likely to be closer.